March | 2014 | Mothers Against Wind Turbines Inc.
A Superior Court decision orders wind project to comply with existing regulations and in another development, the Senate passes a Bill creating more stringent siting standards for wind turbines. The Prince Edward County Field Naturalists (PECFN) gave notice to Gilead and the Ministry of the Environment (MOE) of its intention to request leave from the Ontario Court of Appeal to appeal the Divisional Court ruling that overturned the Environmental Review Tribunal success. PECFN’s Chery Anderson said the Appeal Court registrar is to receive PECFN’s notice of intention Wednesday, March. 12. Lawyers assembled in Osgoode Hall Jan. 21-23 to hear the arguments of the Ministry of the Environment and Gilead Power against the Environmental Review Tribunal ruling that revoked the minister’s approval of the nine turbine project planned for Ostrander Point, on the south shore of Prince Edward County. The decision of the Divisional Court received Thursday Feb. 20 was that the tribunal erred in its ruling. Unless appealed, the decision will result in the industrial development of Ostrander Point Crown Land Block on the South Shore of Prince Edward County. Prince Edward County Field Naturalists are disappointed with the ruling of the Divisional Court and do not agree that the Environmental Review Tribunal was wrong. Read rest of article here. Emotional public objection, scientific and government publications, and legal proceedings all play into the debate around the issue of wind turbines and human health. While some argue that electromagnetic fields, shadow flicker, and audible/inaudible noise from operational wind turbines are related to self-reported health effects, others suggest that subjective variables like visual cue, attitude, personality, and expectations related to media, rather than turbine-specific variables, are linked to reported effects. In his presentation, Dr. Loren Knopper will highlight his experience in the field, the most prominent information found in the popular literature, the state of scientific/medical knowledge on the issue, and provide a weight-of-evidence conclusion on this debate. Dr. Knopper is an internationally recognized environmental health scientist at Intrinsik Environmental Sciences. Dr. Knopper’s career has focused on human health and ecological risk assessment, human and ecological toxicology and health, public communication, and scientific training. He has been involved in risk/scientific communication with a number of stakeholders including government and regulatory officials, industry representatives, aboriginal councils, and the general public. He maintains an active academic practice and holds adjunct professor appointments at the University of Waterloo, the Royal Military College of Canada, and the University of Guelph. Dr. Knopper was recently nominated for the prestigious Eni Award, which recognizes researchers who have achieved internationally significant results in the field of human activity and the natural environment. Please note: This is an open invitation, and may be forwarded to interested parties. Attendees may join in person or via webinar. DISCLAIMER: The opinions expressed by speakers and moderators do not necessarily reflect the official policies or views of Public Health Ontario, nor does the mention of trade names, commercial practices, or organizations imply endorsement by Public Health Ontario. For Seminar/Webinar details please read here. Join Us for the Spring Fling! Mothers Against Wind Turbines invites you to our upcoming community event….our Spring Fling! Friday April 11 @ 7 pm at Wellandport Hall. Please invite your friends and neighbours to attend this event. Its going to be a lot of good fun and fellowship. We are planning lots of food & drink, including coffee, tea, wine, beer, pop, water and a light lunch. We have something for everyone, including card games, games of chance, and other fund raising games. We look forward to awesome door prizes, raffles and a silent auction. *Ticket Pre-Sales available at shelliecorreia@ gmail.com, or call 905-386-0765 Remaining tickets will be sold at the door! Saxony and Bavaria have introduced an initiative to wind power in the Federal Council on Thursday. It’s about the distance from wind turbines to settlements. Then the distance of such plants to houses should be at least ten times the height of a wind turbine. The Saxon Economy Minister Sven Morlok said, it is a matter, targeted to control the construction of wind farms and protect the citizens against sprawl. From the opposition comes criticism. . Thus the energy change was being boycotted, it said. The proposed law had been decided by the State Governments of the two republics at a joint cabinet meeting in July 2013. The Federal Council is to deal in March with the advance of the two German states. Thanks to Bavaria and Saxony! About our rural residence day and night aircraft noise. And now is also continuous noise, continuous turning, continuous infrasound to come over 3km and nocturnal continuous flashing of wind turbines. No thanks! Industrialization of the last natural landscapes for nothing and again nothing, because of weather-dependent, non-storable current leads to nothing. I would have expected the Land of Ideas more intelligence and more empathy for people and nature.. I urge the politicians to remind us of the Basic Law, Article 2, and keep, rather than the health of the citizens continue to trample. NORFOLK – A movement is afoot that could ultimately force wind turbine companies to shut down some units after dark. North Perth Coun. Warren Howard is touring Ontario building support for a common bylaw that would silence turbines after dark if they produce noise that is audible to residents nearby. The Liberals’ Green Energy Act stripped municipalities of planning authority in the area of renewable energy projects several years ago. In a recent ruling, a court said that Wainfleet Township had over-stepped its authority by trying to establish a large setback for wind turbines. However, the judge also said municipalities have the right to pass bylaws on nuisance issues that affect residents’ quality of life. Read rest of article here. 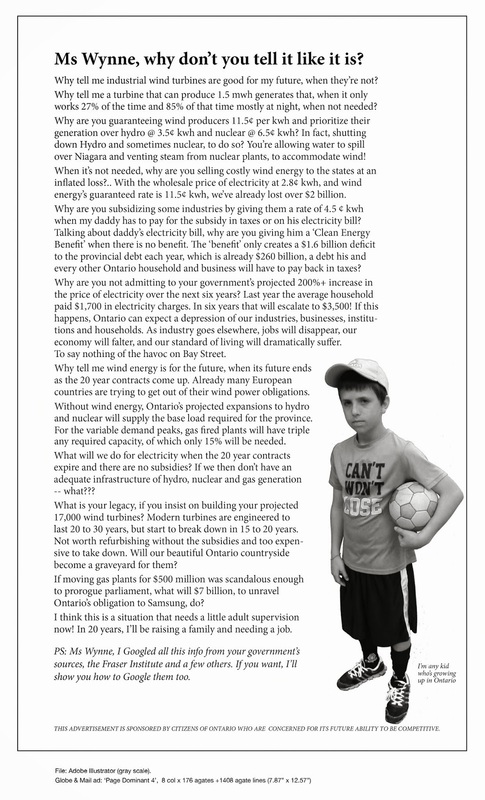 Despite statements made to the media by Ontario Energy Minister Bob Chiarelli that it would be “illegal” to cancel Feed In Tariff contracts with wind power developers, court documents show that the opposite is true, Wind Concerns Ontario states in a letter to the Minister today. At present, Ontario has 55 wind power projects in various stages of approval; if all are approved the costs to Ontario could be more than $1 billion a year or $22 billion over the 20-year life of the contracts.